The year 2018 will stand out for the number of discoveries in the evolution and genetics of bat vision. The emergent picture, however, raises as many questions as it answers, and highlights the difficulty to define what is a phenotype loss and how it happens, even when considering relatively simple traits such as UV vision in bats. This is why a synthesis of recent findings is helpful to piece together the puzzle of bat color vision. Bat photos by Stephen Rossiter. Our paper is available at eLife. Typically, bats have two visual pigments in their retina: the red/green or long/medium-wave opsin and the blue/UV or short-wave opsin. If both are present, the bat species will have dichromatic vision, meaning they can distinguish some colors. If only red/green opsins are present, bats cannot detect potential blue/UV light from fruits, trees or insects, or discriminate among colors. As the ability to distinguish colors could provide an advantage in many activities, including hunting for insects, foraging for fruit, and flying through dense habitats, the visual pigments of bats provide an excellent model to investigate the processes behind the parallel loss of an important functional trait. 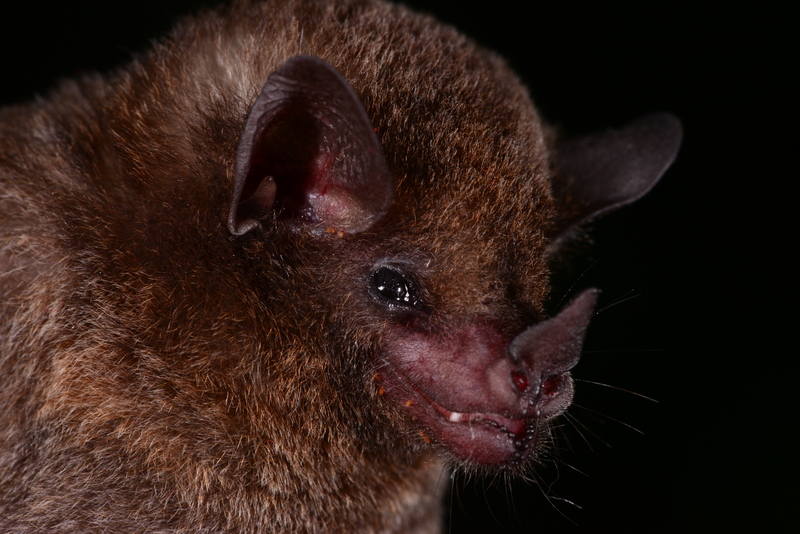 Artibeus watsonii, a primarily frugivorous bat, is a member of the Leaf-nosed subfamily Stenodermatinae. Bats in this subfamily have conserved their SWS1 open reading frame, transcript, and protein in the retina. As a result, frugivory is the most powerful predictor of blue/UV cone retention among bat species of the Americas. The baseline from which various research teams started from was straightforward: Zhao et al. (2009) linked the pseudogenization of the short-wave opsin (SWS1) gene across Old World bats to the evolution of high-duty-cycle (HDC) echolocation —a kind of sonar that enables many bats to detect fluttering targets in cluttered environments—, cave roosting, or both. Crucially, the HDC echolocators of the Americas had not been sampled, and all of their relatives seemed to maintain a putatively functional SWS1 gene. Gutierrez et al. (2018) filled this gap targeting precisely those species that had been missing from earlier work. But they did not find correspondence between the HDC species in the Americas and SWS1 gene disruption. Instead, they found that negative molecular selection on the SWS1 gene had relaxed —an indication of a decline in functional constraint and perhaps a precursor to eventual pseudogenization— in species that forage among vegetation. The proposed sensory tradeoff between color/UV vision and HDC echolocation, however, remained an attractive hypothesis. While Simões et al. (2018) found two species of HDC echolocators from the Americas with open reading frames for the SWS1 gene, Wu et al. (2018) sampled a third species with a SWS1 pseudogene, in line with the sensory tradeoff hypothesis relating HDC to SWS1 degradation. In parallel, and by expanding sampling from the relatives of species with HDC echolocation in the Americas, both Kries et al. (2018) and Li et al. (2018) simultaneously proposed a new sensory tradeoff hypothesis: between UV vision and infrared sensing in the common ancestor of at least two species of vampire bats, a lineage that feeds exclusively on vertebrate blood. Far from settled, the relationship between the evolution of blue/UV and other senses seemed both more complex and richer than had been suspected. The new studies confirmed the SWS1 locus as a “hotspot” with higher-than-expected evolutionary rates. But the links between the ecology of various species and the evolution of bat color vision, and specifically the shifts in sensory demands that led to multiple cases of blue/UV opsin loss remained obscured. Importantly, all but one of the studies (i.e., Gutierrez et al. ) relied primarily on DNA sequences to infer the loss of color vision. Therefore, most of them were not able to capture the sequence of events leading to pseudogenization. Given its tight links with ecology, could the evolution of bat vision help us better understand how and under which pressures pseudogenization happens? Recovering mRNA requires taking a vapor-phase liquid nitrogen dry shipper, such as shown here with Dominican biologist Jesus Almonthe and graduate assistant Elise Lauterbur. 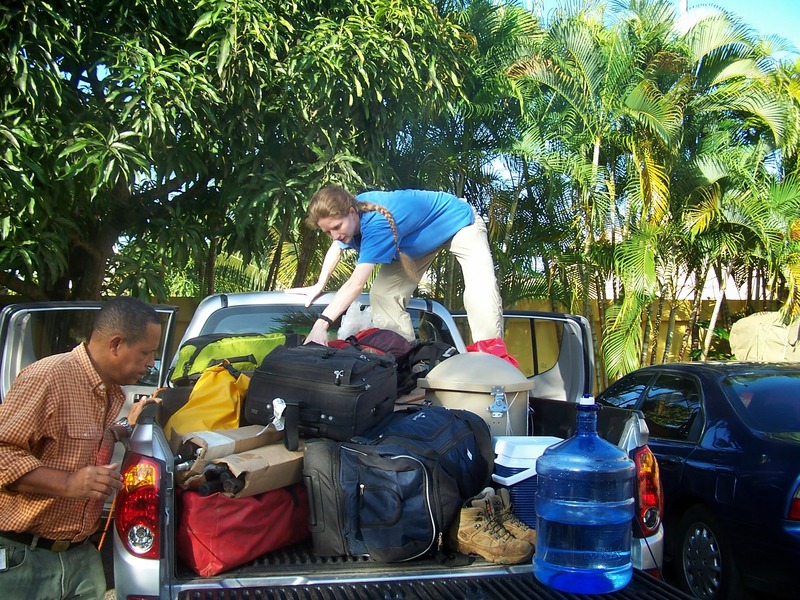 To answer this question, we went on field expeditions throughout the Americas, from Belize to Peru, from the Dominican Republic to Trinidad. The aim was to sample a broad repertoire of relevant species to carry out analyses at the three main levels of the genotype to phenotype path: DNA, RNA and protein. Although a small skin sample is all it takes to obtain the sequence of the SWS1 gene, recovering the SWS1 transcript required dissecting retinas and keeping them frozen in liquid nitrogen the field. Surprisingly, and requiring much tinkering, the presence of the SWS1 protein could be revealed using antibodies from either fresh field specimens, or decades-old samples from one the world’s largest collections of bats at the American Museum of Natural History. 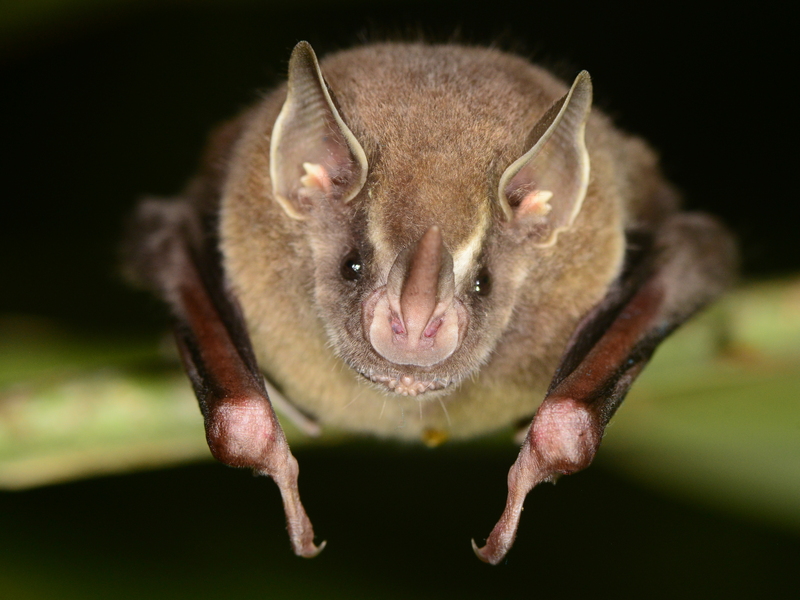 As many of the recent studies did, we primarily targeted a large adaptive radiation of bats in the tropical Americas: the Leaf-nosed bats and their close relatives. While most bat species are exclusively insectivorous, this radiation includes vampire bats, species that pollinate more than 50 species of flowers, and others that disperse more than 500 species of flowering plants. Besides relating this ecological diversity to changes in the blue/UV vision genomic hotspot of evolution, we aimed to discover at which step in the protein production process SWS1 opsin expression is disrupted: whether through nonsense mutation of the gene sequence, mRNA degradation, or disruption of protein translation. Proposed routes explaining variation in S-cone presence in noctilionoid bats. 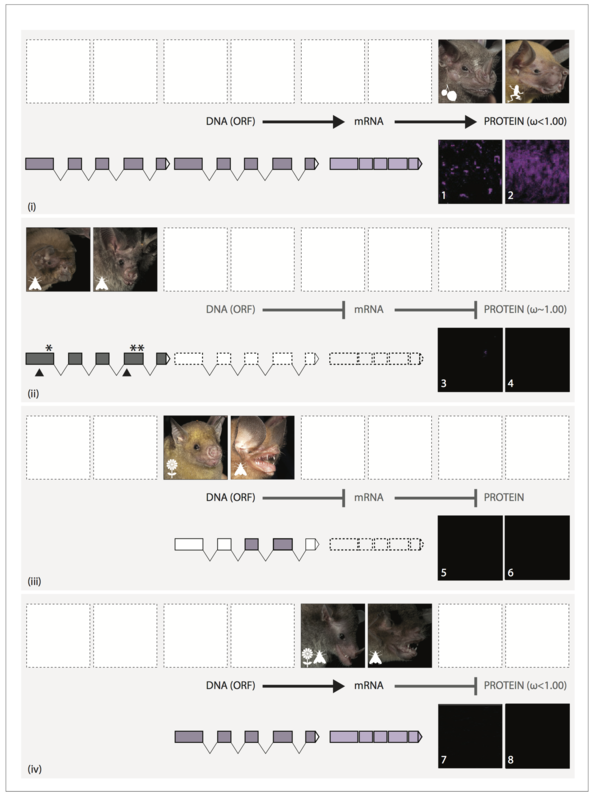 In each panel, upper images show representative bat species, and numbered images show magnifications of their retinas stained for the SWS1 opsin. (i): Information in the intact DNA Open Reading Frame (dark purple) is transcribed to form mRNA (light purple), which is then translated into OPN1SW. We found loss of blue/UV opsins, and therefore the ability to detect UV and discriminate colors, has occurred at least 17 times independently in the target bats (Sadier et al. 2018). Although some of these losses had been previously identified through genome sequencing or PCR amplification, our study reveals color vision can be lost through changes in any of the three different steps of the genotype to phenotype process: DNA, RNA and protein. Therefore, just having a putatively functional SWS1 gene does not automatically mean the protein is found in the retina (and therefore the species has the capacity for dichromatic color vision). Lichonycteris obscura is a primarily nectarivorous bat, and species in its subfamily have been thought to use UV vision to detect flowers. Comprehensive sampling, however, revealed instances of flower-visiting bats lacking blue/UV opsin in their retinas. Although our study did not include multiple instances of HDC echolocation, we were able to test the proposed relationship between color vision and dietary specializations such as insectivory or frugivory. Unexpectedly, a fruit-based diet—and not insectivory, flower visiting, or roosting in caves— was the strongest predictor of a species conserving its blue/UV vision as indicated by the presence of the SWS1 protein in the retina. While this factor was similarly associated with having the mRNA and a putatively functional gene, the relationship was weaker and not statistically significant. By probing beyond the DNA, we have uncovered the different steps by which blue/UV vision is lost. Thus, our results support vision as a highly evolvable hotspot in vertebrates, and this evolvability allows the system to rapidly adapt to changing ecological demands (or lack thereof). The exceptional diversity of Noctilionoid bats allowed us to capture this rapid evolution in action and to reveal the different steps by which the loss of traits occurred, or is occurring. Although biodiversity conservation was not a main goal of our study, by documenting the diversity of visual adaptations and their links to frugivory in this species-rich and ecologically important group of bats, we also hope to aid in efforts to conserve this group of animals and the ecosystems they help shape. Gutierrez, E. d. A., R. K. Schott, M. W. Preston, L. O. Loureiro, B. K. Lim, and B. S. W. Chang. 2018. The role of ecological factors in shaping bat cone opsin evolution. Proc R Soc B 285. Kries, K., M. A. S. Barros, G. Duytschaever, J. D. Orkin, M. C. Janiak, D. M. A. Pessoa, and A. D. Melin. 2018. Colour vision variation in leaf-nosed bats (Phyllostomidae): Links to cave roosting and dietary specialization. Mol Ecol 27:3627-3640. Li, L., H. Chi, H. Liu, Y. Xia, D. M. Irwin, S. Zhang, and Y. Liu. 2018. Retention and losses of ultraviolet-sensitive visual pigments in bats. Scientific Reports 8:11933. Sadier, A., K. T. J. Davies, L. R. Yohe, K. Yun, P. Donat, B. P. Hedrick, E. R. Dumont, L. M. Dávalos, S. J. Rossiter, and K. E. Sears. 2018. Multifactorial processes underlie parallel opsin loss in neotropical bats. eLife 7:e37412. Simões, B. F., N. M. Foley, G. M. Hughes, H. Zhao, S. Zhang, S. J. Rossiter, and E. C. Teeling. 2018. As Blind as a Bat? Opsin Phylogenetics Illuminates the Evolution of Color Vision in Bats. Mol Biol Evol:msy192-msy192. Wu, J., H. Jiao, N. B. Simmons, Q. Lu, and H. Zhao. 2018. Testing the sensory trade-off hypothesis in New World bats. Proc R Soc B 285. Zhao, H., S. J. Rossiter, E. C. Teeling, C. Li, J. A. Cotton, and S. Zhang. 2009. The evolution of color vision in nocturnal mammals. PNAS 106:8980–8985. I'm afraid I can claim no expertise in either genomics or bat vision, but I have been reading about ocean deoxygenation, including the possible problem for marine life insofar as the high energy demand of visual photoreceptors might lead to reduced vision or blindness as less oxygen becomes available in warming waters. When you say "Thus, our results support vision as a highly evolvable hotspot in vertebrates, and this evolvability allows the system to rapidly adapt to changing ecological demands (or lack thereof)," do you think this might offer some hope in regard to that scenario? There is a vibrant literature on the evolution of vision loss in fish (e.g., in caves), and part of the reason color vision has been proposed to be an evolutionary hotspot. However, I am unaware of such response to reduced oxygen availability, or if the energy constraints are such that color vision loss would make a difference. Best course of action is to dive into that literature! organisms. Phil. Trans. R. Soc. A 375: 20160322. I'm sure this will be a topic for more research in the future!